West Nile virus, Lyme disease, dengue fever, and plague are examples of “vector-borne zoonotic diseases,” caused by pathogens that naturally infect wildlife and are transmitted to humans by vectors such as mosquitoes or ticks. “This collection of papers offers a bridge between ecologists and clinicians whose combined efforts are needed to address the ongoing challenges of emerging zoonotic diseases,” said Kilpatrick, an assistant professor of ecology and evolutionary biology at UC Santa Cruz. Emerging infectious diseases can be roughly split between introduced and locally emerging diseases. 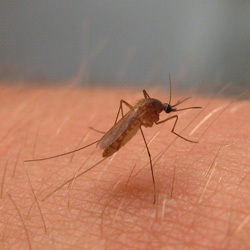 Introduced diseases arise from the spread of a pathogen to a new location, as when West Nile virus arrived in New York in 1999 and subsequently spread across North America. Locally emerging diseases increase in importance in areas where they are endemic, as with Lyme disease in the United States over the past three decades. These two types of emerging diseases can differ markedly with respect to infection dynamics, or the number of cases over time, Kilpatrick said. “Introduced diseases often cause a big spike in infections and then decrease substantially. Locally emerging diseases often show a steady, sustained increase,” he said. “Increasing human population and the urbanization and agricultural intensification of landscapes puts strong selective pressure on vector-borne pathogens to infect humans and be transmitted by vectors and hosts that live around humans,” Kilpatrick said. “So far, climate change has been a relatively minor player compared to land use and socioeconomic factors in the emergence of vector-borne disease,” Kilpatrick said. The incidence of any vector-borne disease involves a complex interplay of multiple factors affecting animal hosts, vectors, and people. Kilpatrick and Randolph emphasize that control of these diseases requires combined efforts by clinicians and public health officials to treat patients, promote behavior likely to minimize the risk of infection, and advise on efforts to reverse the ecological drivers of transmission through vector control, urban planning, and ecological restoration. Kilpatrick’s research on the ecology of infectious diseases is supported by grants from NSF and NIH.